As you can see the map does not cover a large swathe of territory. Razorhurst is a Sydney novel but that map is not all of Sydney, it’s not even all of Surry Hills, the suburb (neighbourhood) where Razorhurst is mostly set. It’s a tiny, tiny part of Sydney, which got me thinking. I say I know Sydney better than any other city in the world and that’s true. But I hardly know Sydney at all. The Sydney I know is a handful of suburbs (neighbourhoods). I rarely go any further west than Marrickville, further north than the city, further east than Paddington, further south than Alexandria. I’m the total opposite of this bloke valiantly striving to walk every street in the city. My New York City is similarly constrained. I’m fascinated by those first two groups because they live in worlds I never intersect with except at the gym. Their Sydney is not my Sydney.3 I’ve never been anyone’s enforcer. Never been involved in any kind of robbery. Never sold drugs. Never done whatever else it is that those guys do that I don’t know anything about because I am so not part of that world. I do know a bit more about bodybuilding because the bodybuilders sometimes talk about it.4 What I’ve overhead is mostly about what they can’t eat in the lead up to competitions and them fretting about their body fat percentage. I’ve also overheard loads of stuff I can’t make sense of because I don’t know enough of the specialised language of their world. Bodybuilder 1: I just need to get down to 4%. Bodybuilder 2: You’ll get there! Stay away from tuna. Fattiest fish ever. Me: (not out loud) If you’re only 4% body fat how do you not die?! Tuna’s too fatty? Um, okay. Bodybuilder 1: I miss salt way more than fat. Bodybuilder 2: I miss salty fat. Food with flavour. Bodybuilder 3 (under her breath): Weak. So weak. There are as many different Sydneys as there are Sydneysiders. Hell, there’s more than that because visitors experience a whole other Sydney. I have been known to say that I am unfond of London and also of LA. My London is always rainy and the people are really rude. My LA consists of me being stuck in a car feeling like I’m going to throw up. I’ve only been to both cities a handful of time and know them hardly at all. My London and LA are awful. But I have many friends who adore both places. Who can’t understand why I don’t like London/LA. When I describe my LA/London they just stare at me. It doesn’t resemble their city at all. 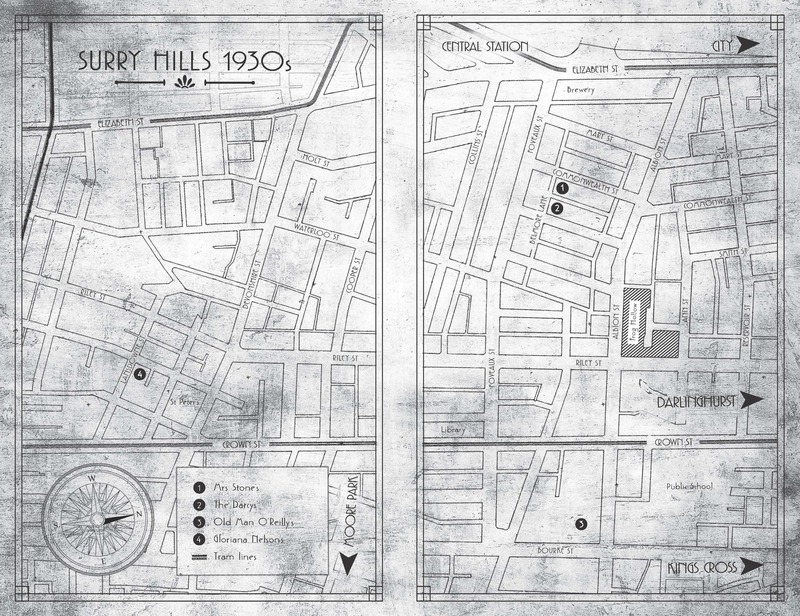 The map above is of my imagined Surry Hills of the 1930s. It’s a map of my Razorhurst, a place that never existed except within the fevered imagination of the tabloid Truth.7 We all know novels are imaginary. But I often think that the places we live are also imaginary. My Sydney isn’t like anyone else’s. Neither is my New York City. They exist almost entirely in my mind. In how I interpret (and interact with) the place I live in. Maybe cities are secretly novels. Or vice versa. Either way I love cities and novels and wish I could know and understand them so much better than I do. TL;DR: Look at the map for Razorhurst! How gorgeous is it? Very. Cities are vast and complicated and unknowable. Loved this post! Absolutely loved it grin beginning to end. You are so right–and I never thought about it in those terms before- -that our cities are our own. You could apply that theory to everything. My restaurant is not their restaurant, my art not theirs, etc. Thank you!! Going to try and think about this and how others go through their lives this week. Definitely. I have that experience all the time. Friends ranting against a restaurant/book/person I love dearly and how they describe it is as if it was an entirely different restaurant/book/person. My LA is the same as yours. But one of my closest friends loved it with such a passionate love that she uprooted her life to move there. Every time she talked about her city, I thought, “Why does she think it’s a perfect hybrid of San Francisco and New York? It’s nothing but a traffic jam!” But somewhere beyond that traffic jam, there’s a city that has everything and buzzes with energy and contains a really great person. Also, juxtaposition magic has occurred. I will be stuck all weekend thinking about vampires who are actuaries. Or actuaries who are vampires. It’s not a bad combination, if you stop to think about it. Many great people. I know I’ll never see that LA unless I learn to like cars and, well, I really don’t like cars. But at the same time, as you say, it’s cool to think about how wonderful it is to other people. I’ve always thought it would be fun sometime to try and write LA from the pov of someone who loves it. *snort* I was thinking more of the extended data set they could accumulate. Hah! My Paris is an awful unfriendly place– I know everyone has a completely different Paris than me! Whereas I’ve always dreamed of going to London, so if I ever do I sure hope I don’t find yours! (No desire to visit ANYbody’s LA, really). Congratulations on getting a map in a book!